Entry Fee: $20 for first entry, 10 for each additional image. 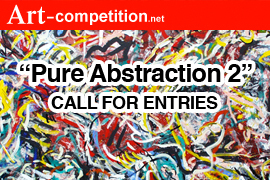 Art-Competition.net announces a Call For Entries for “Pure Abstraction2” in All 2D Still Mediums, for an online Group Exhibition, up to 15 artists will be chosen for the online exhibit. Deadline: March 7, 2016 (Midnight EST). Theme “Pure Abstraction” The work should be purely abstract with little to no depiction of the real world (as in nonrepresentational). This work must rely on form, color and line to create an abstract work of art with little or no reference to the external world. The Artists and Exhibit will be extensively marketed with numerous Press Releases, Social Media Marketing, Event Listings & Event Calendars, and featured in our Art Market Newsletter with over 17,000 subscribers. PRIZE DETAILS: 15 artists will be chosen for a group exhibit at Gallery25N online. The exhibit and artists will be extensively marketed with numerous Press Releases, Social Media Marketing, Event Listings & Event Calendars, and featured in our Art Market Newsletter with over 17,000 subscribers. Not eligible to enter? - Find contest where you are. COPYRIGHT: The artist retains all copyrights to their artwork without exception. USAGE RIGHTS: competition.net website and in our newsletters, and in the marketing of the art competitions to the general public. Artworks will not be used for any other purpose than that which is stated here. All winning entries will be displayed on the art-competition.net website. Each entry becomes part of the public, historical / archival online contest catalog. It can be removed at a later date upon request.